This June & July, Subatomic Sound launches the first annual Dub Champions Festival on the west coast in Los Angeles & San Francisco. The events begin June 18 and end July 5. In LA, the festival includes performances at the legendary Dub Club @ Echoplex and at Los Globos with the Dub Siren HiFi custom built 16,000 watt Jamaican style sound system plus educational music workshops at the new Dubspot music production and DJ school opening this June in Hollywood. In San Francisco the festival includes a performance and workshop at the longest running dub event in the world, Dub Mission @ Elbo Room. 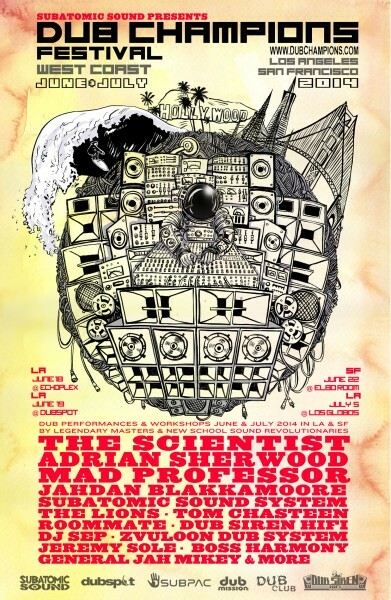 After three years in New York City and the North East and two years in Europe, Subatomic Sound is proud to present the 1st Annual Dub Champions Festival on the West Coast in cooperation with Dub Club @ The EchoPlex, Dub Siren Hi Fi, the new Dubspot music school in LA plus Dub Mission in San Francisco. The festival is several day journey into the international musical phenomenon known as “dub”, a musical style characterized by heavy bass, drums, and copious use of effects, where the producers become the artists and the mixing board becomes an instrument. The festival will include performances and educational workshops to exhibit how the music is created and how it has evolved from its roots in ‘70s Jamaica to become a cornerstone of electronic bass music. Dub is a major inspiration to artists across many genres including rap, rock, punk and dance music. 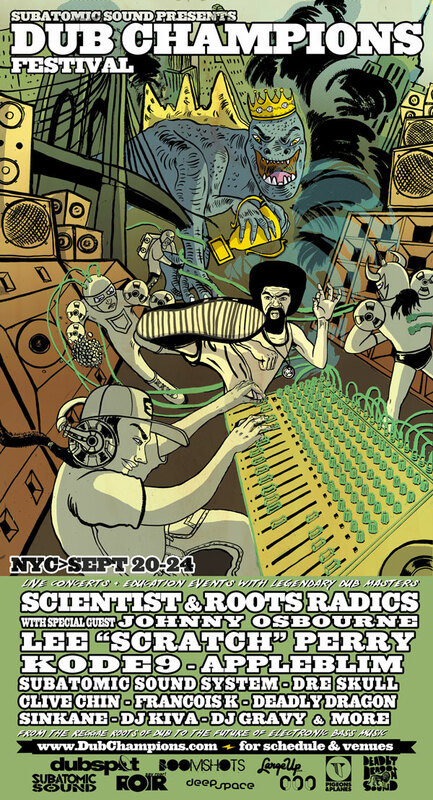 Dub Champions Festival was founded in New York City by Emch of Subatomic Sound System and is dedicated to featuring the world’s greatest dub pioneers from Jamaica as well as current innovators on every continent. The festival has taken place in New York City, Washington DC, Philadelphia, Boston, Vienna, Amsterdam, and now debuts in San Francisco and Los Angeles. We would like to introduce you to DUB CHAMPIONS FESTIVAL 2012, September 20-24, the most ambitious Subatomic Sound project yet, from the reggae roots of dub to the future of bass music, a five day excursion from the past to future of dub history & influence featuring the the world’s greatest dub inventors and innovators: Scientist & The Roots Radics, Lee Scratch Perry, Kode9, Clive Chin, Appleblim & more. Sign up at www.DubChampions.com for more details and event discount.